According to our friends at NerdWallet, the average U.S. household carries $132,158 in total debt. See the table below for the average amount of each type of debt per household. Taking those numbers into consideration, it’s no surprise that many Americans are struggling to save for emergency funds or contribute to retirement accounts. According to a 2015 retirement survey, 41 percent of workers are “not too confident” or “not at all confident” that they will have enough money to retire comfortably. This makes sense because the report also noted that 42 percent of workers ages 45 and older have less than $25,000 in savings or investments. That’s not much to live on in retirement. The survey results also noted that 67 percent of current workers expect to have to continue working for pay during their retirement years and 23 percent of current retirees do work for pay. A big reason those statistics are as dismal as they are is because Americans are having trouble getting out of debt. Debt is hard to avoid completely and once you do have it, it sometimes feels like a snowball effect. Don’t let debt take over and keep you from achieving your long-term goals. The key is to get debt under control and then maintain it. Have a monthly debt load that exceeds 28-36% of your gross monthly income. There are two main causes of debt ballooning: minimum payments and interest. These are especially dangerous when it comes to credit card debt. There are two main causes of debt ballooning: minimum payments and interest. These are especially dangerous when it comes to credit card debt. The typical credit card issuer will only require the minimum payment to be paid each month. It’s tempting to forgo paying off the entire balance and just pay that small percentage. However, the amount you don’t pay at the end of each cycle rolls over to the next and then accumulates interest. You have a credit card with a $1000 balance. The credit card’s interest rate is 18% and the minimum amount you need to pay is $25 per month. If you only paid the minimum balance each month, it would take you 5 years and 3 months to pay the $1000, but it would end up costing you $1566 because of the interest that would accumulate. 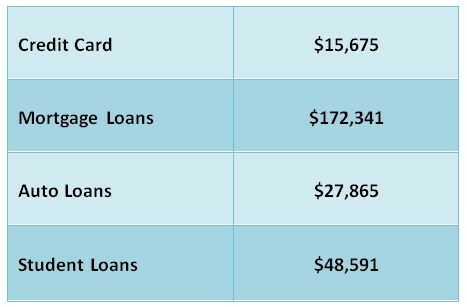 Check out the Credit Card Debt Calculator from ReadyforZero.com to calculate your own numbers. Credit card debt is just one piece of the puzzle. That small $1000 credit card balance may not seem like much, and perhaps the $1566 payment at the end doesn’t either, but consider all of the other things you are paying for as you are paying off this credit card. You may have a mortgage, car loans, student loans, your children’s tuition, and not to mention everyday life necessities such as groceries and clothing. It’s easy to see how debt can get out of control. Obviously, the best plan is to get out of debt sooner rather than later, but how? There are several steps you can take to start reducing your debt load. Start charging only what you need and what you can afford to pay off in full each month. Do you really need the new iPhone7 or is your iPhone6 still working just fine? Do you really need the $7000 king-size memory foam mattress or will an $800 queen-size traditional medium-firm mattress give you an equally good night’s sleep? Take the debt with the highest interest rate and start paying it off aggressively. If you have multiple credit cards, for example, take the card with the highest interest rate and pay as much as you can above the minimum payment while continuing to make minimum payments on the other cards. Once the first card is paid off, divert those payments to the next most expensive card and so forth. Many credit card companies offer attractive rates on balance transfers. Find a company that doesn’t charge fees to transfer balances and has a reasonable interest rate. Move all your balances to one card. This makes paying off your debt simpler. For more information on transferring balances, check out CreditCards.com’s article: What is a balance transfer? 9 things you should know. If you’re a homeowner, you may want to use your home’s equity to pay down your debt. Chances are that with a home equity loan or line of credit, you’ll get a better interest rate than a credit card and you may be able to deduct the interest from your federal income tax bill. Again, if you are a homeowner, refinancing your mortgage could help. If you have enough equity in your home, you can refinance your loan for a higher amount than you actually owe the mortgage company (cash-back refinance) and use the extra money to pay off higher-rate debt. Check out this post from Bankrate.com for more information on cash-back refinancing: When is cash-out refinancing a good option? If your debt load is too much to handle, seek help from a professional credit counseling service. A credit counselor can help you manage your debt, negotiate with your creditors and implement an affordable repayment schedule. Once you’ve gotten your debt under control, don’t forget to pay yourself. By this I mean putting money into savings and retirement accounts. Given the statistics mentioned earlier about Americans and their retirement savings, or lack thereof, it’s important to think about your future. After working hard to maintain your debt, you deserve to enjoy retirement without having to work because you need the money.